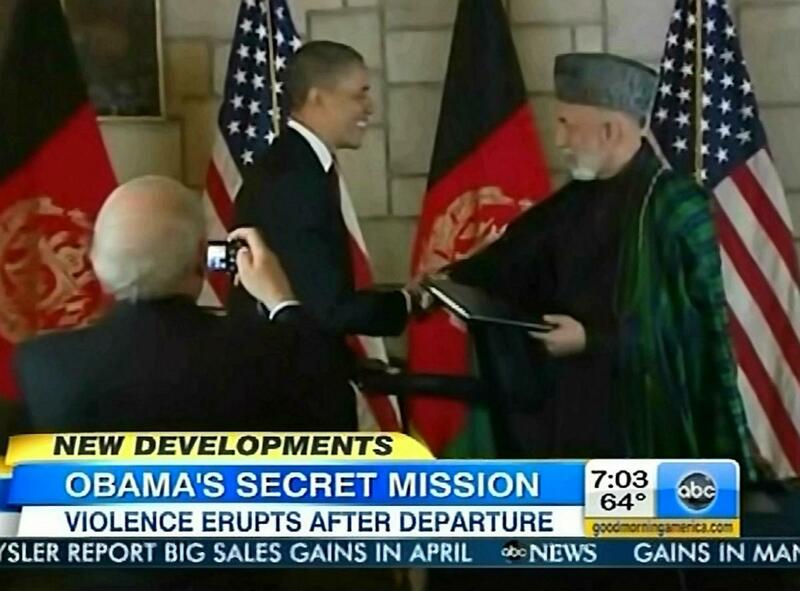 The same networks that huffed and whined about George W. Bush's secret trip to Iraq over Thanksgiving in 2003, calling it an "embarrassing" "presidential shell game," had no such harsh language for Barack Obama's clandestine visit to Afghanistan on Tuesday. Jake Tapper on Wednesday deemed the visit simply a "surprise." On CBS This Morning, Scott Pelley proclaimed it "remarkable," insisting, "These things are always kept secret, in the Bush administration, in the Obama administration, until the President arrives safely." Yet, on the November 30, 2003 CBS Evening News, Mark Knoller bitterly complained, "It was professionally embarrassing to be clueless...And from now on when I report that the president is at his ranch, neither you nor I will be sure of it." How did Knoller react on Tuesday? He registered no complaints, mildly tweeting, "Pres. Obama left Washington last night under cover of darkness from Joint Base Andrews a little after midnight." On the November 30, 2003 Meet the Press, Mike Allen (then of the Washington Post), griped about Bush's surprise visit to Iraq: "The reporters who joined us at Andrews Air Force Base in Maryland, their phones were confiscated. So we really did have a bag pulled over us." A day earlier, on the November 29, 2003 Saturday Early Show, host Randall Pinkston used similarly annoyed language, promising to explain the "inside story" of how "the White House press corps were fooled by a presidential shell game." MARK KNOLLER: The reasons for the misleading information and deception were understandable. The danger in Iraq is very real; lives were at stake, including the president's. KNOLLER: So it was only after the president was wheels up from Iraq that the reporters with him were able to tell what they knew and the rest of us didn't. It was professionally embarrassing to be clueless in Crawford, though I'll get over it, but it means when I tell you that the president is at his ranch, it means neither you nor I can really be sure about it. Randall. On the November 27 CBS Evening News, then-anchor John Roberts explained that Knoller "was one of dozens of reporters kept in the dark by the elaborate deception." SCOTT PELLEY: [Obama] made an unannounced trip there today on the first anniversary of the killing of Osama bin Laden. NORAH O'DONNELL: Air Force One touched down at Bagram air base under the cover of darkness, a sign of the secrecy and security surrounding the President's trip. BRIAN WILLIAMS: On our broadcast tonight, on the ground tonight in Afghanistan. Tonight the President's unannounced visit there landing in the dark and much secrecy a year after bin Laden was killed. CHUCK TODD: Now, the White House did not lift the embargo until the President was safely inside Hamid Karzai's presidential palace in Kabul. Apparently, presidential deceptions are only a problem some of the time.